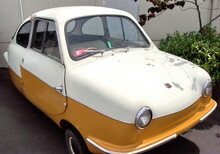 Another curious "micro-car" to emerge in the 1950's was the Nobel, a licence-built version of the German Fuldamobil. Built by Ulster shipbuilders Harland & Woolfe the Nobel certainly benefited from the expertise of many famous names such as Shorts, Bristol (both aviation firms) and Lea-Francis. Amazingly Nobel also built these micro-cars in South Africa, Chile, Greece, Holland, Sweden and India. Production finished in 1961 after around 1,000 cars had been built.